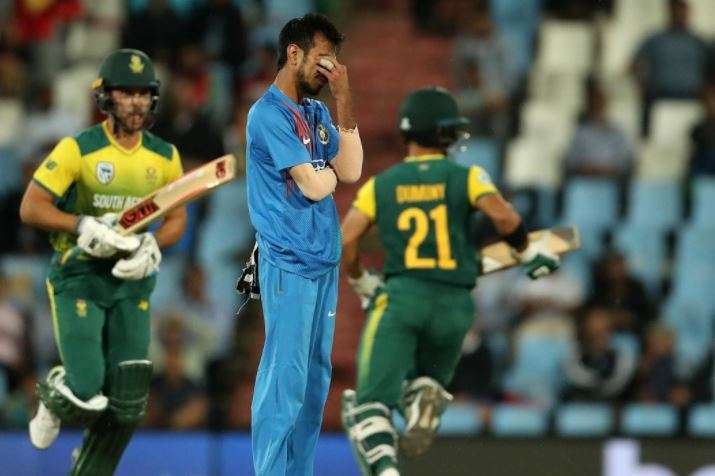 Duminy felt that a good start boosted their chances as the Proteas bowlers rattled the Indian batsmen by dismissing Rohit (0) and Kohli (1) early in the match. Image Source : BCCI Yuzvendra Chahal reacts after a catch being dropped as Duminy and Klaasen run between the wickets. South Africa rode on Heinrich Klaasen and in-stand skipper Jean-Paul Duminy's fifties as the Proteas managed to claw their way back into the series 1-1 as the hosts won the 2nd T20I at Centurion by 6 wickets. The Virat Kohli led Team India managed to reach 188 with the help of Manish Pandey's compelling knock of 77* and former Team India captain Ms Dhoni's blazing fifty. It was the second half-century in T20Is for both the Indian batsmen. Centurion was a belter for Team India who didn't manage to take control as Rohit Sharma was sent off for a duck in the second over. Shikhar Dhawan (24) and Suresh Raina (30) pooled in with their breezy knocks but to everyone's surprise, it was Virat Kohli who didn't last long as he was sent back to the hut by Junior Dala, who practically stunned the Indian top and middle order batsmen. A happy South Africa skipper, Duminy felt that a good start boosted their chances as the Proteas bowlers astonished the Indian batsmen by dismissing Rohit (0) and Kohli (1) early in the match. India managed to hang on with the help of Dhawan and Raina's contribution, which was later carried on by Dhoni and Pandey's fifties to reach 188. However, Duminy felt that it was an 'easy' win in the end. "The way we started with the ball was exceptional. They gained momentum with the last five overs but our batsmen showed composure. Pretty easy win in the end. We tried our utmost to keep with the DLS system," said Duminy in the post-match press conference after winning the 2nd T20I. South Africa were quite comfortable at Centurion despite Jaydev Unadkat rattling the hosts with early dismissals, Klaasen and Duminy took matters in their hands and managed to chase down the target with ease. Miller and Farhaan Behardien finished the job for the hosts who now stare at the penultimate match of the series and the tour. "In the end, it worked in our favour because it gave us the freedom. It was raining a bit in our bowling innings as well. We knew we had to set the tone with a good first over. They came at us a bit but it was key to pick wickets in the powerplay." "To take down 189 was a pretty good effort. Certainly will be a good crowd for Cape Town. Hopefully, we can put up a good spectacle," concluded Duminy. India play South Africa in the 3rd and final match of the series and Tour at Newlands, Cape Town on February 24.